A meaningful feminist agenda demands bold action and sustained funding to achieve significant change in the lives of women and girls. Budget 2019 targets many areas essential to advancing gender equality, building on initiatives announced over the last three years, but falls short on investments in child care, pay equity and poverty reduction—investments critical to closing the gender gap. The evidence is clear: investing in women’s organizations is the single most effective means to building better public policy and better lives for women. [i] Budget 2019 proposes to boost funding to women’s rights organizations, allocating $160 million to the Women’s Program over the next five years, bringing the annual total to $100 million in 2023-24, more than triple 2015 levels. This increase in resourcing represents a significant win for the women’s movement who have fought for many long years to rebuild after a decade of austerity. Our colleague, Kate McInturff, in her last appearance before the Finance Committee for Budget 2018 consultations challenged the government: “If I can convince you to take one action to make one change that has the power to change lives and indeed to save lives … it is this: invest in women’s organizations.” With this announcement, women’s organizations will now have the means to strengthen their capacity and impact. The budget includes other positive measures that will support diverse women and girls, including new regulations to promote diversity on boards and in senior management, resourcing for the implementation of a National Dementia Strategy, and investments in a variety of youth employment programs and a new training credit. Forty-five million dollars is being allocated to fund a new Anti-Racism Strategy and Secretariat and additional money is being invested in community-level work of LGBTQ2+ serving organizations. These programs and others will make a difference in closing gender gaps and paving the way for greater gender equality and shared prosperity. At the same time, Budget 2019 could have done more. Funding for a national child care plan was missing, even as parents continue to pay incredibly high fees in many cities across the country. The federal government’s current 10-year funding commitment for child care will leave Canada in last place in the OECD—far short of its recommended benchmark of 1% of GDP. Also missing were needed investments to ensure the successful implementation of federal proactive pay equity legislation. As it stands, affected women will be waiting years before they receive fair compensation. We’re also still waiting for a National Action Plan to address Vio­lence Against Women that includes targets, timelines and the resourcing needed to propel meaningful change. Gender-based violence currently costs the economy an estimated $12 billion a year, according to Justice Canada, and is a problem that has directly affected more than a million women in the past five years. Budget 2019 tinkers in the margins, but doesn’t offer needed relief for those struggling to afford the basics of day-to-day life. Raising the earnings exemption for the Guaranteed Income Supplement is an important advance for older workers over age 65 (mostly men)—but offers little support to the much larger group of poor seniors who don’t have paid work. Canada’s new Poverty Reduction Act passed last December establishes for a set of targets for reducing poverty in Canada, an official poverty line, and a framework and a process for reporting publicly on progress. Low income Canadians, however, are all still waiting for a comprehensive plan to eradicate poverty and tackle the living conditions of those in greatest need. This is a fiscal plan that hints at solutions but underinvests—this despite a stronger than expected revenue picture and the lowest levels of debt to GDP in the G7. There is no more revealing figure than the proportion of program spending to GDP. Already at historic lows, program spending is on a downward track, projected to decline from 14.5% in 2017-2018 to 13.8% in 2013-24. The government’s commitment to gender-based budgeting is something to celebrate. 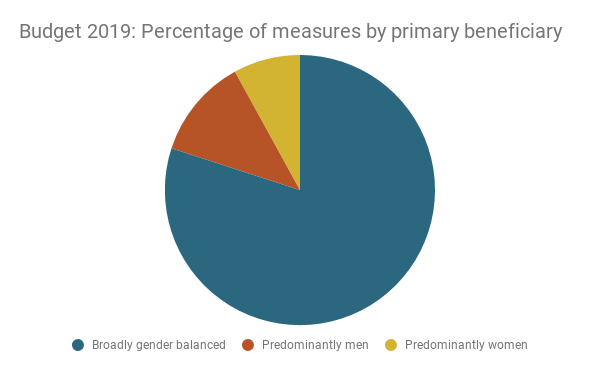 This year’s Gender Report represents the most comprehensive effort to date to identify the characteristics of the groups expected to benefit from government policy and their distributional impacts—information essential to developing and implementing public policy that delivers. Changes to student loan programs, for example, will benefit women who pursue post-secondary education in large numbers and carry large student debts for their efforts. The extension of parental leave for graduate students and the new Dementia Strategy will also primarily benefit women because, in the first instance, women are more likely than men to take up parental leave, and in the second case, are at greater risk of developing dementia. Source: Finance Canada (2019), Investing in the Middle Class, p. 252. By contrast, men are expected to be the primary beneficiaries of research and development tax credits—in their roles as shareholders (men receive a larger share of investment income) and as workers in scientific and technical occupations where men outnumber women. Purchase incentives for zero-emission cars and the public infrastructure needed to support their use—another Budget proposal—will also directly benefit the predominantly male workforce in automotive sector. With a better understanding of the intended (and unintended) impacts of policy, governments can take steps to help level the playing field. This year alone, departments developed mitigation strategies to compensate for or offset negative impacts for 15% of the measures announced in the Budget. Another 8% of measures proactively took steps to reduce barriers to participation. When economic policies are made based on this kind of gender analysis, we have the opportunity to reduce the number of women experiencing violence and poverty. We have the chance to clear the way for women to have equal access to decent work and decent pay. To truly close the gap for women living in Canada, we need sustained action. We need policy that targets discrimination against Indigenous and racialized women, women with disabilities, and gender diverse people. We need high quality affordable child care and elder care. We need investments in the sectors where women work. We need a strong social safety to ensure that all Canadians live with dignity. Investing women’s organizations is a critical step on this path. [i] Batliwala, Srilatha et al (2013). Women Moving Mountains: The Collective Impact of the Dutch MDG3 Fund. Toronto: AWID. Htun, Mala and Lauren Weldon (2012). “The Civic Origins of Progressive Policy Change: Combating Violence against Women in Global Perspective, 1975–2005.” American Political Science Review, Vol. 106, No. 3 August 2012. Sawer, Marian (2012). “What Makes the Substantive Representation of Women Possible in a Westminster Parliament?” International Political Science Review.